Polypropylene with vinyl backing. Flocked logo made up of thousands of individual coloured fibres. 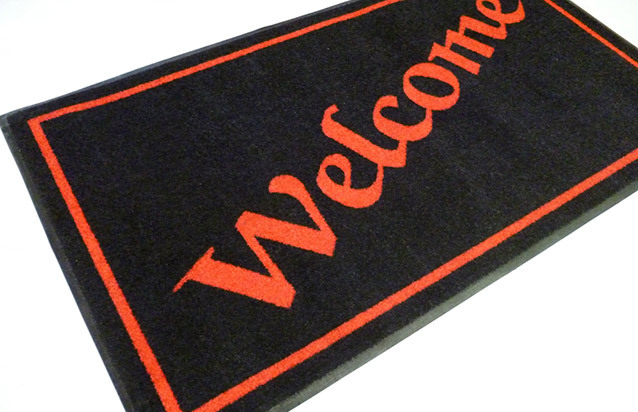 PolyPlush Logo Mat mats has a flecked colouring, dirt and debris that is removed from foot traffic is far less noticeable. PolyPlush logo mat is tougher and more durable than regular logo mats. Having a solid logo colour against a flecked background creates a stunning effect. Your logo or design will have a crisp and sharp edge. Each fiber of your logo is individually coloured before it is fired into the mat. We place thousands of these individually coloured fibers into our custom mats to ensure a densely packed result. We then cure and cross link the fibers into place. As there is no ink or dying involved, the fade resistance is unparralled. PMS color matching available. 10mm flat vinyl edge. Heavy Duty Edging may be applied. Grey, Blue, Red, Green, Beige and Brown. 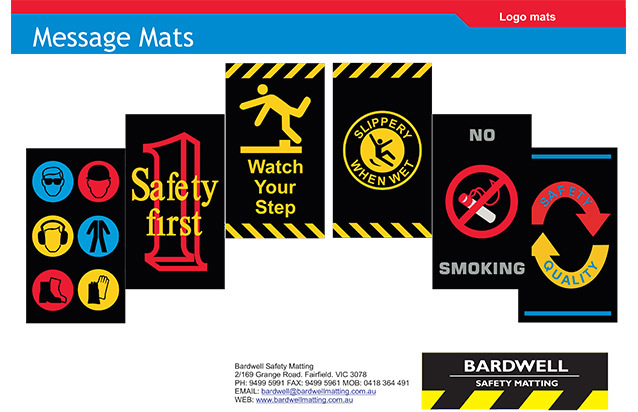 PolyPlush Logo custom mats are a great option if you’re after an impressive looking custom mat that is specifically designed to hide dirt and debris. As the carpet pile used in PolyPlush Logo Mat mats has a flecked colouring, dirt and debris that is removed from foot traffic is far less noticeable. Some people prefer PolyPlush mats over other styles as they feel it has a more commercial look & is suited to higher traffic entrances. Others simply like the way their logo looks on the flecked background. Having a solid logo colour against a flecked background creates a stunning effect. The process for placing your logo or design on the Logo mat is unique. No ink or dye is used as this can fade over time. Your logo or design will have a crisp and sharp edge. The embossed effect we achieve is not only raised which adds texture, but visually, it really jumps out at you like no other custom floor branding product. Each fiber of your logo is individually coloured before it is fired into the mat. We place thousands of these individually coloured fibers into our custom mats to ensure a densely packed result. The electro – static attraction of coloured particles. We then cure and cross link the fibers into place. As there is no piece dying involved, the fade resistance of the PolyPlush Logo Mat custom mat is beyond all other options. A close PMS colour match can be achieved for your logo or design.